We've been told that larger fish contain more mercury than smaller fish. But now we're finding out that this is not the whole story. Where fish feed - deep in the ocean or near the surface - affects their levels of mercury as well. Researchers from the University of Michigan and the University of Hawaii are now discovering that mercury affects ocean fish differently at different depths within the ocean. The deeper you go in the ocean, the more mercury tends to accumulate. This happens in part because organic mercury breaks down through photochemical reactions that occur in the well-lit surface waters. But the deeper you go, the less light is able to penetrate and break down the mercury. As a result, we're finding a lot more mercury in the deeper waters. 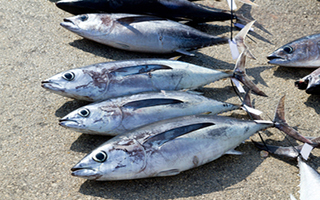 For the study, the researchers used a highly sophisticated mass spectrometer to measure the stable isotopic compositions of mercury in nine species of marine fish found in the Pacific waters around Hawaii. The species feed at various depths. Six were predators and three were prey. They found that sunlight-driven chemical reactions destroyed up to 80% of monomethylmercury for fish who fed near the well-lit upper depths. But they also determined that quite a bit of monomethylmercury was entering the marine food supply at deeper levels. University of Michigan researcher Joel Blum explained, "The implication is that predictions for increased mercury in deeper waters will result in higher levels in fish. If we're going to effectively reduce the mercury concentrations in open-ocean fish, we're going to have to reduce global emissions of mercury." Exposure to methylmercury, which typically happens in humans through the consumption of large predatory marine fish such as swordfish and tuna, can lead to damage to the central nervous system, the heart, and the immune system. It's especially dangerous for the brains of babies and young children. UH researcher Jeffrey Drazen notes that "the results of our research allow us to determine which marine fish are likely to have lower mercury concentrations and why mercury concentrations are higher in some fish compared to others." This information will certainly help us all make more informed food choices to limit our exposure to mercury. Eating more small fish is not the answer to protecting yourself from mercury. The oceans are becoming more contaminated and are likely to get worse over time. The solution is to find a way to remove mercury from your body before it causes harm. The best and safest product I've found that does just that is PectaSol Detox Formula.